Most of us are accustomed to buying used goods - who doesn't love a bargain?! Clothing, cars and furniture are all popular things passed through owners, but there are a few things you should avoid buying used, and a mattress is one of them. See below for some reasons why. It's not difficult to make a mattress look clean and inviting. Foam, springs and other materials all degrade throughout use. Bodily fluids, oils and spills can all drastically accelerate the deterioration and are often difficult to notice upon first inspection. How has it been looked after? Ever seen a mattress resting against a wall down a street, gathering dirt and looking sorry for itself? How do you know this isn't the exact mattress you're looking to buy, it's not difficult to make an old mattress look clean and tidy. It could be infested with bed bugs without your knowledge, which could cause havoc in your home. 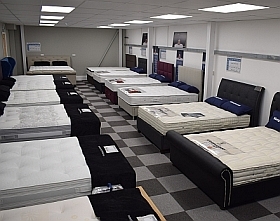 When you go looking for a new mattress you can almost hand pick the style of support you wish to go for, helping you get a good nights sleep on a mattress that suits your sleeping position and your body weight. It's very unlikely that a used mattress would meet all of your comfort requirements. Most people are selling their mattress because it's no longer fir for their requirements. It could be too uncomfortable, worn, have an off-putting smell, they could be getting rid of it due to down-sizing or other honest reasons, but not always. If you're looking to buy a used mattress which is already 7 to 8 years old, you'll most likely end up replacing it again, so why not skip this and buy new from the beginning? Mattress technology evolves each year, just like software and technology. You could be left with something insufficient, for example memory foam has always been considered a warm sleep, though this day and age the mattress cover can be treated to draw moisture from your body - keeping you cooler, or even the memory foam can be altered to include cooling properties.